For years, those suffering from back and joint pain have had to deal with a number of unproven and costly devices that offered no guarantee of actually helping. However, doctors have long recognized that suspending a body upside down or at an inverted angle helps to reduce the pain and symptoms of joint and back problems. Short of a doing a handstand or visiting a costly doctor, having access to an inversion table is the only and best way to take advantage of these therapeutic benefits. 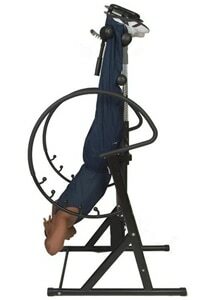 By hanging upside down a person is able to relax the entire body and that the traction created by this motion will help lessen the pain of back and joint problems. With so many inversion tables available for purchase it can be difficult to choose the right brand and model. Luckily, we’ve made the job easy for you by reviewing the best inversion tables of 2015 available for purchase today. Height capacity: 4'8" to 6'6" 4'10" to 6'9" up to 6'6" 4'8" to 6'6" up to 6'6"
For individuals suffering from back, shoulder or upper arm pain but who still want to workout on a regular basis using an inversion table can help lessen the likelihood of a debilitating injury. 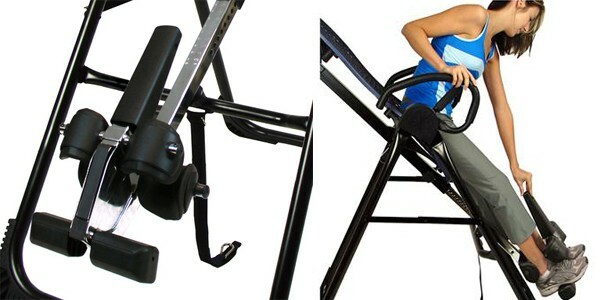 The foam covered Ironman Elite 1000 is a budget friendly inversion table that is no frills option for any user. Designed for users up to 300 pounds and 6’6” tall, this inversion table allows your back to relax by letting gravity do the work. Some users complain that the Ironman Elite 100 is difficult to put together and the reliability has been reported as below average. However, for individuals not looking to spend a lot of money the Ironman Elite 1000 is a great option at a price of only $139 on Amazon. Designed to reduce back pain while improving a person’s posture, the Teeter Hang Ups EP-950 is our number 4 ranked inversion table of 2015. 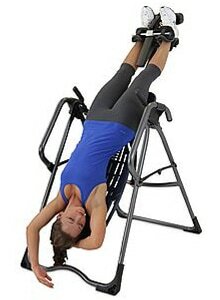 Manufactured from a mesh-like material, this inversion table uses patented flex technology that responds in the direction your body moves to increase and improve your range of motion. 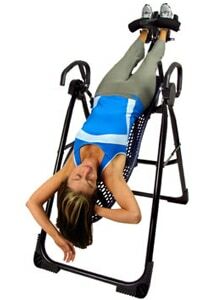 This inversion table uses an EZ Angle tether strap that lets the user rotate the inversion table to 20, 40 or 60 degrees. Available with a five-year warranty, users can rest assured that the Teeter Hang Ups is reliable and durable enough to withstand a maximum of 300 pounds. 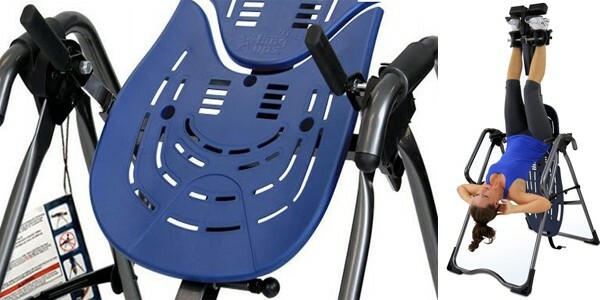 While many users of this inversion table did rave about the chair’s ability to mitigate their back pain, several complained that the chair was not very stable and difficult to store. 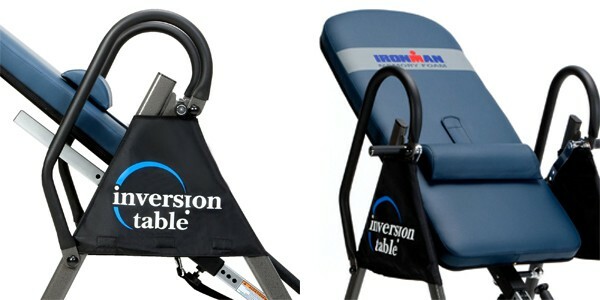 Although manufactured from the same company as our #5 ranked product, the Ironman Inversion Table is a much better option at only a slightly higher cost. Easily able to hold individuals up to 350 pounds, the backrest of this table is made from memory foam that helps the person relax while in the inversion position. 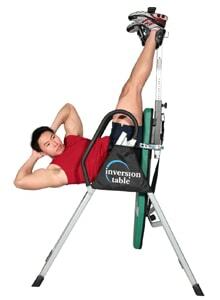 Offering three different angle adjustments, this inversion table can tilt up to 90 degrees. The table easily folds for storage anywhere in your house and uses a scratch resistant paint to keep it looking new even after years of use. 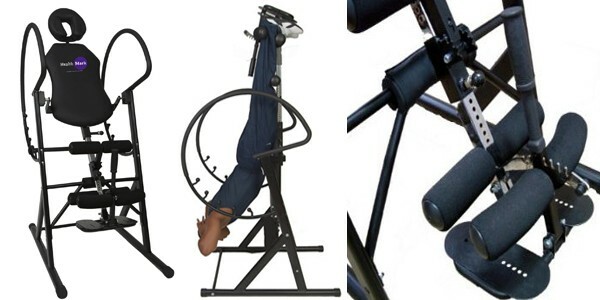 While users did praise the Ironman Inversion table for its practical design, many others felt that this product fell short of expectations because it became uncomfortable after long periods of use. While our number 2 ranked inversion table may cost more than any other product reviewed it is by far a great option for those suffering back and joint pain. 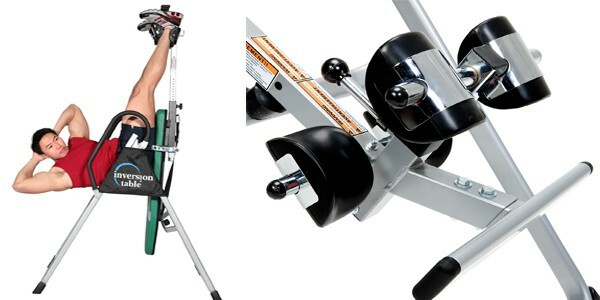 Despite its high cost, the Health Mark Pro Max Inversion Table is designed for either face-up or facedown inversion. Amongst the many features of the Pro Max inversion table is a 600-pound weight capacity and user height range from 4 feet 10 inches to 6 feet 9 inches. The table can be manually adjusted for 6 positions and has an inversion range of 180-degrees. Designed to mimic the comfort of a bed, the Teeter Hang Ups EP-960 helps alleviate the pain from any joint or bank injury. With its state of the art design that finds each person’s pressure points, the Teeter Hang Ups inversion table helps mitigate pain through balance, stretch grips and angles of either 20,40 or 60 degrees. Despite being more expensive than several of the tables reviewed here, the Teeter Hang Ups EP 960 is an excellent value that is sure to make anyone’s aches and pains disappear. Unlike many other products from the list, Teeter Hang Ups EP-960 offer a 5 year warranty! These inversion tables sound great. I’ll take a look on Amazon. Are they all available on Amazon?